1. Copy the text below and paste it into a text box in Publisher using the PASTE SPECIAL > Unformatted Text function. 2. Use the guidelines that you learned from page 49 to format your columns. 3. You may arrange this story any way you would like but it must spread 2 two pages. 4. Place a headline "Marketters are Into YouTube"
5. 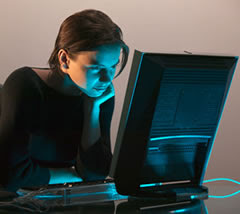 Include the following picture and a caption that reads "Student watching Youtube"
Yet another reason for traditional TV outlets to worry about their relevance: YouTube.com, the hot new outlet for people to post and share homemade videos, has caught the attention of big-name marketers. Nike, Warner Bros., MTV2 and Dimension Films are among the firms seeding the site with commercial clips. Now, along with consumer-made videos of newborn babies, weddings and teens pulling pranks, is a short of soccer star Ronaldinho in his new Nike sneakers. Part of YouTube's lure is its ease of use. Consumers — and advertisers — can upload clips quickly. The site, which is like a virtual photo album that hosts millions of short videos, is simple to search. As broadband penetration grows, and consumer appetite for on-demand entertainment swells, video-sharing sites such as YouTube are taking off. In December, when it formally launched, users watched 3 million videos daily. Now, it's about 40 million. That buzz has piqued the interest of major marketers, ad agencies and media buying firms. "From a brand standpoint, it's become another way to reach consumers," says Barry Lowenthal, president of ad buying company Media Kitchen. In a world teeming with cynical consumers and ad-skipping devices such as TiVo, YouTube's edge is that its users actively seek out content. When word-of-mouth built about Nike's gritty Ronaldinho clip, consumers e-mailed the video to friends and embedded it in their profiles on social networking sites. It has been viewed more than 3 million times. The price for Nike? Not much. The sneaker maker shot a digital video, then uploaded it for free. As YouTube's must-see status swells, some firms want more formal arrangements. At the end of March, E Networks and YouTube struck a deal for the site to feature various E program clips. Deep Focus, a marketing firm representing studios such as The Weinstein Co., and MTV2 have both worked with YouTube on promotional opportunities. Weinstein recently ran a trailer for Scary Movie 4 from its Dimension Films division. "Within 24 hours, we had 250,000 views of the trailer," says Deep Focus CEO Ian Schafer. "Within a week, we had a million." Deep Focus also placed the worldwide premiere trailer for Clerks II, which Weinstein is releasing with MGM. It was viewed 150,000 times in the first two days, says Schafer. YouTube won't disclose financial or other details, but in most cases, those companies get preferential treatment, such as plugs on its home page. Clips that run as part of more formal agreements are usually marked with the logo of the firm that placed them to let viewers know they are promotional. Other firms aren't officially working with YouTube but are uploading videos on their own. To hype Superman Returns, Warner Bros. posted video blogs from the movie's director. Not all publicity on YouTube is welcomed. Earlier this year, NBC asked the site to pull down pirated clips of a Saturday Night Live skit because of copyright concerns. "When alerted by rights-holders about unauthorized videos, we will cooperate with them to remove the links," says YouTube spokeswoman Julie Supan. General Motor's Chevrolet saw firsthand how YouTube exposure can dent a brand's image. It recently launched a contest that let consumers use Chevy-provided images and music to make their own Tahoe commercial. Some people created harsh, anti-SUV messages about global warming, then promptly posted them on YouTube. YouTube also asks its community to self-govern for violent or pornographic material and to report offenders. To promote Howard Stern's Howard TV video-on-demand channel, iN Demand Networks posted a series of risqué clips. IN Demand Executives felt YouTube still gave them more flexibility than broadcast TV. "It's an unfettered environment where Howard fans can meet and celebrate his comedy," says iN Demand head of marketing Sergei Kuharsky. Despite potential pitfalls, marketers see opportunities. "It's fantastic from a consumer research standpoint," says Lowenthal. "You can type in a search for 'shopping' and then see (videos) of people showing their shopping habits. It's almost like a global focus group — all for free." As it grows, YouTube's challenge is to turn the rising tide of advertiser interest into dollars. The company expects to reap ad revenue in the first half of this year but is cautious. To remain relevant, it needs to serve paying advertisers without looking like a sellout to its millions of average users. "We want to be sensitive on how we deal with that," says CEO and co-founder Chad Hurley. "Because we really are a community, we want to build things for our users and not alienate them." YouTube is funded by Sequoia Capital, which invested $3.5 million in November, and another $8 million earlier this month.